Novelist Vendela Vida liked eating healthy but had no idea how to cook that way—or any way, for that matter. 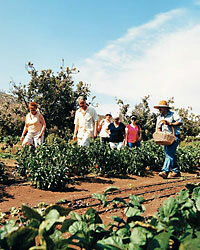 But a visit to the new cooking school at Mexico’s celebrated Rancho La Puerta spa turned into a culinary epiphany. Despite my hungarian grandmother’s efforts—in fact, in spite of everyone’s efforts—I have never been a good, or even knowledgeable, cook. Proof? Recently, when preparing a meal for my two-year-old, I had to search the Internet to figure out how to soft-boil an egg and steam asparagus. Over the years, friends have given me cookbooks to convince me to spend more time in my kitchen. "You like healthy food, and these recipes are both healthy and easy," they say, offering their books with carefully outstretched hands, as though handing me a cake. I accept each volume with optimism—this will be the one that converts me!—before I place it in the drawer where we keep candlesticks and other never-used items. I had resigned myself to a life without cooking, a life without understanding why people even enjoyed the labor that goes into preparing meals, until I visited Baja California’s Rancho La Puerta and its brand-new cooking school. For those unfamiliar with Rancho La Puerta, the now-famous destination spa was founded in 1940 by a Hungarian scholar, Edmond Szekely, and his wife, Deborah. Americans would cross the border to meditate, exercise, follow a vegetarian diet and listen to Professor Szekely’s lectures, the topics of which ranged from the importance of eating healthy food to the proper amount of daily sun exposure (20 minutes, in his opinion). Over the years, Rancho La Puerta grew popular with Hollywood actors preparing for a role. To this day, Deborah Szekely, now 85, is actively involved in the ranch, and the 100-something guests who visit each week talk about her with the sort of reverence usually reserved for nuns. I had agreed to an assignment to spend a few days at the Ranch and check out the new cooking school, La Cocina Que Canta ("The Kitchen That Sings"). I thought that taking a break from the novel I’d been working on would serve me (and the novel) well, but I was also curious about the classes. With a setting—and a name—like that, maybe this school could inspire me in a way no cookbook has. Upon arriving at "the ranch," as it is called by its devotees, I was stunned by the size: Since its inception, the property has grown to encompass more than 80 casitas and 3,000 acres, with sloping, landscaped grounds and gardens planted with purple Mexican sage, oleander, cacti, rose geraniums and pink pepper trees. Mount Kuchumaa, which sits on the border between the U.S. and Mexico, rises protectively in the background. My days started at 6 a.m. with one of the Ranch’s various hikes; my favorite was a two-mile walk to the property’s six-acre organic garden and farm. After arriving, my group would sit at outdoor tables and eat breakfast: verbena tea, homemade granola and frittatas made with the farm’s eggs and some of the garden’s 18 types of peppers. In addition to the hikes, I started off my week doing just the morning fitness classes and afternoon spa treatments—and procrastinating on committing to any cooking sessions. I took Pilates and yoga, then decided to push myself and try things I didn’t do back home: African dance, salsa and Aqua Plus, a pool workout designed to strengthen core muscles. At the spa, I sampled therapies like the herbal body wrap, hydrotherapy massage and something called "Energy Balance," in which my masseuse redirected energy between my chi points. I can’t tell you how she did this, but I do know that at one point she swept a bouquet of herbs (jasmine and verbena among them) over my body—and I don’t think I’ve ever been so relaxed. But after two days, spending afternoons at the spa was starting to feel a little too indulgent. How much loofah-ing did my skin require? Guilt turned out to be just the motivation I needed to finally sign up for those cooking classes. And as a bonus, I figured spending time at the cooking school would provide a break from the spa’s dining-room meals. The food—vegetarian two or three nights a week, with seafood served on the other nights—is good without being extraordinary, but returning to the same place for every meal reminded me of college. On the afternoon of my first cooking class, I changed from sandals to sneakers (open-toed shoes aren’t recommended for the kitchen—all those novices and knives) and got into a van for the 10-minute ride to La Cocina Que Canta, adjacent to the organic garden I knew from my morning hikes. I was expecting the school—a 4,500-square-foot space—to have a sterile feel, almost like a hospital wing, but I could not have been more wrong. The terra-cotta-colored walls, pinewood tables and chairs, Talavera tiles and Mexican textiles immediately made me feel like I was in a warm, familial atmosphere—one not unlike my Hungarian grandmother’s kitchen. The glass doors on the dining side of the room open up to the organic garden. Michel Stroot, formerly head chef of the Ranch’s sister property, Golden Door in Escondido, California, led our two-and-a-half-hour, hands-on class. Belgian by birth and looking younger than his 69 years (a fact that he attributes to eating well), Stroot put together the day’s menu from his diverse repertoire of 900 dishes: risotto with wild rice, cremini mushrooms, basil and Asiago cheese; grilled herbed prawns on rosemary skewers; and plum-banana sorbet. Although many of the recipes are lower in fat than traditional versions, Stroot told me that the school doesn’t promote calorie-counting. Instead, menus are designed to be low in sodium and to deliver four ounces of protein and two-and-a-half to three ounces of complex carbohydrates. There’s no limit on vegetables. I warned Stroot that I was not an, ahem, experienced cook. He didn’t seem fazed; in fact, he takes various levels of expertise into account when organizing each class. For every recipe to be taught that day, he creates a separate station in the kitchen (and assigns one teaching assistant per station) and lets students pick which dishes to work on. A fan of sorbet, I headed for the dessert station. I sliced plums and bananas, mixed them with brown sugar and water, and simmered them in a pot. Stroot had me add a little more water, as the garden plums weren’t as juicy as the Santa Rosa ones he recommends for the recipe. I could smell the sweetness of the fruit rising from the pot, and I felt a sense of pride. I was already planning to make the sorbet at home, until I saw the pricey-looking ice cream machine required for the final step. My daydream of making sorbet for friends was about to be dashed, but Stroot said I had another option: freezing the mixture in an ice-cube tray, then putting the cubes in a blender with apple juice. After our work was done, the class sat down to eat the food we had prepared. Somehow the process of cooking had relaxed me—dare I say even more than my massages had. In the past, whenever I’ve been creative, it has involved using words, and trying to find the right word to describe something. At the school, I began to understand how finding the right fruit or vegetable combination was like forming a good sentence. My class the next evening was taught by Jesús González. González, who grew up in Mexico City and, later, San Diego, is another Golden Door alum and now the lead chef at the cooking school. I asked González what the school’s name ("The Kitchen That Sings") meant to him. He said he believes "when you sing to the garden, the garden sings back to you." Every day, González checks the ripeness of the vegetables to pick the recipes for that day’s class. "When you go to a restaurant, the first thing you taste is salt," he said. "Here, I want people to taste the freshness of the vegetables, of the herbs, of what we have in the garden." At the beginning of the class, the more experienced students stepped up to the station where the shrimp ceviche tostadas were to be prepared, while a number of men raced to the area designated for making the Ranch’s signature guacamole (the recipe uses peas in addition to avocado to cut the fat). Others went for garden zucchini soup; tomato and roasted pepper salad; or Mayan chocolate sorbet. I chose the strawberry-tomato gazpacho, mainly because it involved a lot of chopping. I figured I couldn’t go wrong. Apparently I could. After observing me, González came over to teach me a "better way" to chop. He turned my right-handed grip on the knife slightly to the left, so my fingers were on top of the handle, and the knife became an extension of my arm. After that, things went a lot more smoothly. During the class, students were encouraged to go to the garden to pick any extra vegetables they needed for their dishes. As the sun began to set, I wandered through the well-tended rows of crops, past the melons and peppers, to pluck basil for my gazpacho. As we sat down to dinner, we were handed folders with the recipes for that night’s meal. While all the food was good, the guacamole was amazing, and I knew I would make that again. (Some people might not consider making guacamole "cooking," but for me, this was progress.) In addition to the recipes and the nutritional tips, I knew I would take something else away from the Ranch and from the cooking school: a sense of portion control. In the Ranch’s main dining room, helpings are small compared to restaurant standards, and although food is served buffet-style at the cooking-school dinners, I’d gotten used to eating smaller portions. I realized that a variety of flavors is enough to satisfy my appetite. While wine isn’t served at the Ranch, each student got one glass at the cooking-school dinners. This "portion control," when applied to wine, seemed a smart way to make sure we students retained what we’d learned in the classes. One woman at my table turned to her friend. "This was so much better than the cooking class we took in Italy last summer," she said. Her friend agreed: "In Italy, the focus was so much on wine that I was drunk by the time we finished cooking. I don’t even remember what we ate." Vendela Vida, author of the novels Let the Northern Lights Erase Your Name and And Now You Can Go, lives in San Francisco.